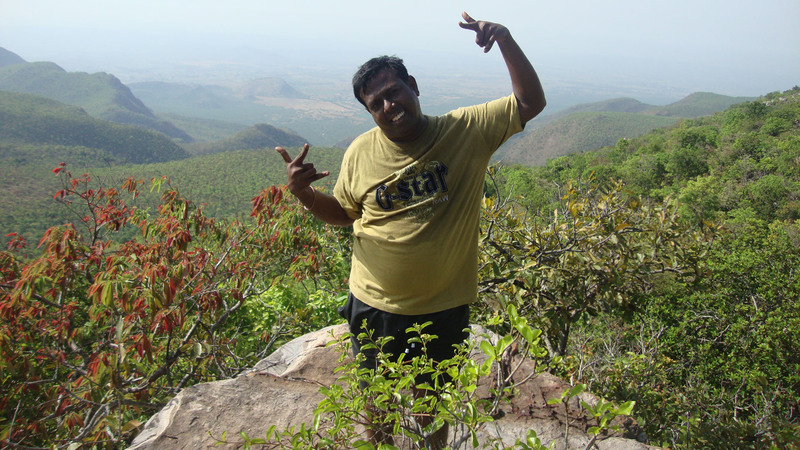 When I took my first trek to Parvatha malai on Jan 2, 2010. The common talk i heard from the fellow trekkers is that they had been to N35, N42 etc.. Was wondering whats this N35 etc.. Later found its the trek series to a near by location called Nagala puram located in the Tamil nadu – Andhra pradesh borders. Started following the trek invites.. and found a freshers trek invite with a funny name called ” Junglie Lungie” and it was a days trek. Registered immd and participated too.. which was a easy one. Tempted me more to explore nagala. 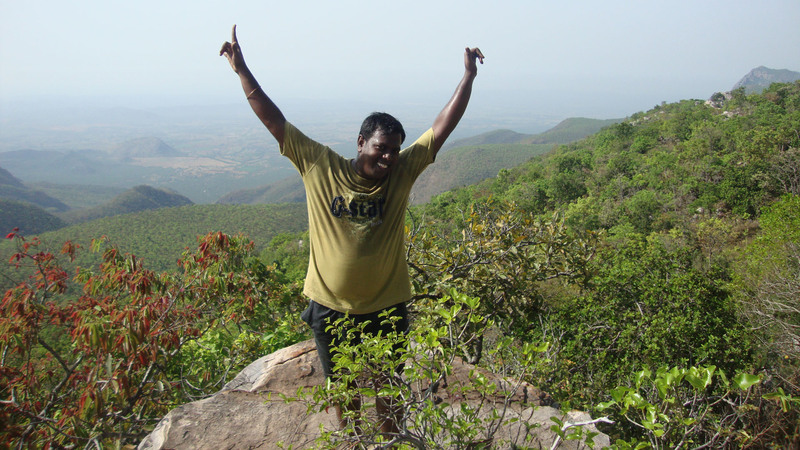 Immediately signed up for the next 2 days trek announced by Biju – the same organizer who did ” Junglie Lungie”. Never expected its gonna turn about my life time experience …. 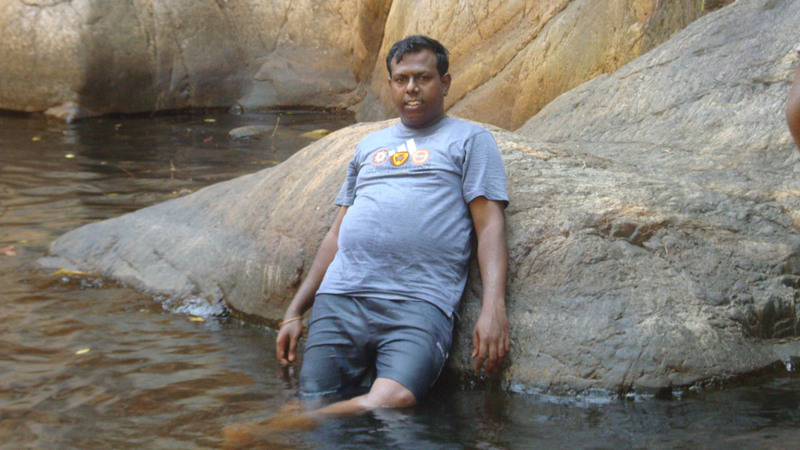 My 3rd Trek – In Search of origins of Nagala – May 2010. We reached the Base camp around 7:30 and once we were ready with all the rations for the trip, Peter gave a small intro regarding the Trek, the wonderful route and its beautiful surroundings to Sherif, the Host from Ufx Channel as we had a camera crew that came all the way with us). Then Biju (the organiser) gave the customary but mandatory instructions to be followed and then we started our walk towards the first pool and lucky enough we reached the first pool within 15 minutes of walk. I was slowly removing my bag and shirt to get into the water when some stupid local guy had disturbed a honey bee comb. The next thing I knew i was under water with some 10 people already there. There was a buzzing sound through and I could see utter chaos. Some people were jumping into water and some people huddled themselves under the sleeping mats. The next morning we woke up early around 5 and saw Peter already well awaken.Peter and Biju were further discussing about what next to do and where to have the lunch and whether to explore newer pools. We started packing all our stuff and everyone got ready with their backpacks.Then we reached the water source in 10 mins time and refilled our bottles. Those willing to stay behind were told to look after the bags and the others left all their stuff down and carried only the bottles. Surprisingly almost everyone agreed to go for the 800m peak and only about 5-6 people stayed behind. Slowly the team moved on in its mission to conquer the 800m peak. Even though we had started at 650m and it was just around 150m higher, it was a little bit testing. The route was pretty decent to start with. But the higher we got it became a lot sunnier and also the elevation became more steep. We proceeded towards the 780m peak. The approach was same all the way with the occasional big rocks that we needed to climb. Peter and Biju were already up that peak and were waving to us from there. This inspired us more and we almost doubled up towards the peak. It was almost right at the top where there was just one slippery piece of solid rock. But considering the destination so near that part was overcome the easiest ever. The view from the 780m itself was amazing. I saw the whole valley from there. The best part was it was blistering hot due to the sun but still we could get a cool breeze all the way. We had lots of photo sessions there and spent some 10 mins there. That is a short time considering the time we took to come there. But it was long considering the next destination. The next destination was 800m and it was right before our eyes. We could see clearly the 800m peak from our present spot and that was a big inspiration for us to keep going. We hurried on to the next peak. That was a further 100 meters away. The location was superb. It was a mixture of greenery, dried grass and the odd rocks and Finally we reached the 800m peak. It was a great feeling and i felt a tremendous sense of achievement. With the satisfaction of having gone to one among the highest points in Nagala, all of us returned back. Infact everyone’s bottle was completely empty by the time we started the descent and no one even felt the need for it. Maybe it was because we were heading back to the water source. But to many including me, it was the personal satisfaction at being able to conquer such heights and being there that made us forget the sensation called thirst. We reached the source around 10:30 and filled up our water bottles. We kept bragging about our achievement to those that didn’t come. Within 20 mins we were all up and moving. Our first halt was supposed to be a Big pool and all were looking forward to it. Little did we know that this was gonna be the most adventurous part of the trek. We passed our camping spot and it was already blistering hot. The sun was burning at us and trying its best to roast us. But we were upbeat and walking briskly since we had just had our water break and were very much looking forward to the next pool where we can unwind ourselves. We first headed to a small hill top. But then everyone stopped and we took a detour to another side. In the new route used to be a waterfall and enjoying in the waterfall was on everyone’s mind. We headed towards it and we arrived at what looked like the top of the falls. But it was bushy and full of thorns and so we took a turn and thought of going to the falls by the side. We thought we reached the tip of the falls and it was indeed the tip of the falls. But the water part of it was missing. There was not even a drop of water anywhere nearby the cliff and when we looked down, we couldn’t see the base. So we assumed the water would be there and descended the cliff. We kept walking for how long no one knew. There was no indication of water and time and we kept walking and walking….It was during this walk that people showed their first signs of fatigue. Peter was long gone and he had said he wont return until he finds water. That was our only hope which kept us going. I kept on walking with various partners during the course. Finally i sighted peter and some people who had gone in the front grouped at a spot under the trees. Peter and Biju started frantically searching the GPS and old maps for a sign of water or exit. According to the GPS, there was a small hill left of us and crossing us would show us water. We decided to take some rest and then we started again to cross the hill. It was an easy climb, but the descent was tricky. There was no definite path, just a sandy descent and behold we saw the first signs of water. It was a small pool and we could see it from the top itself. I was eagerly looking forward to having some water and jumping in when we heard instructions not to go near the water. Yes, it was dirty water and we had to just be satisfied on seeing water. The next part was the most challenging. It was high noon I guess and the sun was at its merciless best. We kept going on the trail all along without water and with no signs of it. There were the occasional teasers where there will be water in small ponds but dirtier than our cooum. No way we could drink that. Slowly and steadily the pace of the group was dropping. People were almost reaching the threshold of their tolerance and many shoulders were dropping. When i mean people that includes me. Even though i did not feel any fatigue, my pace slowly dropped. I started taking breaks at more regular intervals and it became so regular. We could see the others at a distance and i almost started running thinking that they found water. Indeed they did find water and they were all grouped together. But the only problem was water was beneath a 50m cliff we didn’t have any means by which we could get down there since unfortunately we lost the rope that we had. So it was like back to square one and we were huddled together under shade contemplating our next course of action. We checked the GPS and found out a water source same like last time just other side of cliff. Only this time the regulars were pretty sure where it led since they had been to that pool and it was close to the destination. We took a break for around half hour and then started to climb the cliff. I was to follow Biju.I got slowed down and that was when fatigue slowly crept into me. I started feeling a little drowsy. I tried to salivate my mouth with some water to freshen up and nothing came up. I started breathing hard to keep me awake because here i was caught up in traffic on the edge of the cliff with no way up or down and i cant afford to lose my concentration even for a split second. Biju then started pushing me hard…and we moved a little paces up. I am totally tired and saw Peter was standing up and the guys had grouped almost on top of the cliff. Even my spirits soared and now i was moving in bursts. Peter then came down to help me and lead him to the top. Then on the top Biju showed us the next course of action what we are gonna do and where were headed to. He showed us the temple where we must go and also the route how we should go. He then said that he along with ashwin and anand will leave late and take another route and the rest of us must go with peter in an easier route. We were no longer the 60 we started with. There were 6 people including the driver and camera man of the TV crew missing and they had taken another route. Then there were another 5 people including the host who had taken another route. We were praying we meet them at base camp. 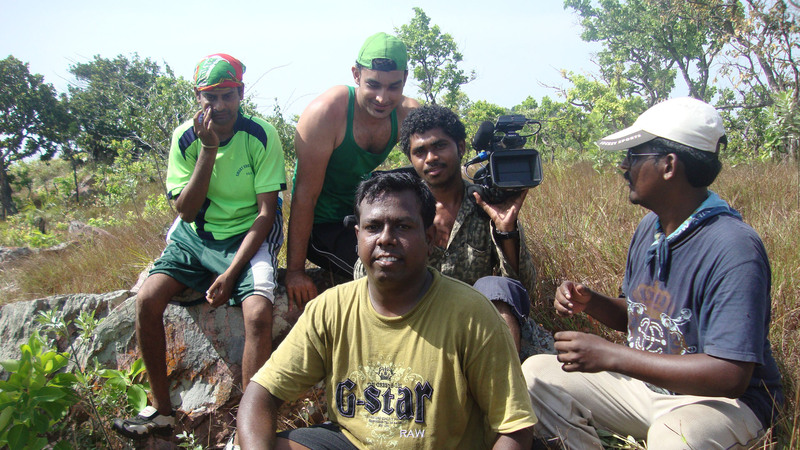 At this stage Biju seeing my situation, assigned a couple of guys i.e Aswin and Anand who are experienced trekkers.. They both kept pushing me … and we were scaling the hill around. It was quite tiresome and we Aswin gave me the idea of trekking for 10 mins and take rest for 20 mins.. Likewise if we keep moving.. will somehow reach the base camp and walked for the first 10mins faster thinking about the following 20mins break. Anand was going ahead me following him and ashwin was behind me. I was watching my clock and counting the seconds for the ten minutes to get over. Surprisingly saw Anand lying in the grass… thought that its the destination for 10 mins and i too lied next to him. Ashwin who followed me too did the same. When we lied i could see some light… and the time was around 6.20PM and planned to start walking again at 7.PM. We all slept due to tiredness and when we woke up it was 12.40AM. Shocked and tried waking up Ashwin and Anand. Ashwin woke up and we realized that Anand wasn’t lying out of tiredness… he got fainted.. OMG! Shook him badly and brought his conscious back. He clearly mentioned that he cant even step one foot ahead without water. Searched for others… and found some lights at a far away distance. Thought they might have reached the base camp. Shouted for help here and there.. only acoustics no one responded. Tried to reach some one in the team through mobile… none of them were in the coverage area. We had signals as we are on top of the hill. 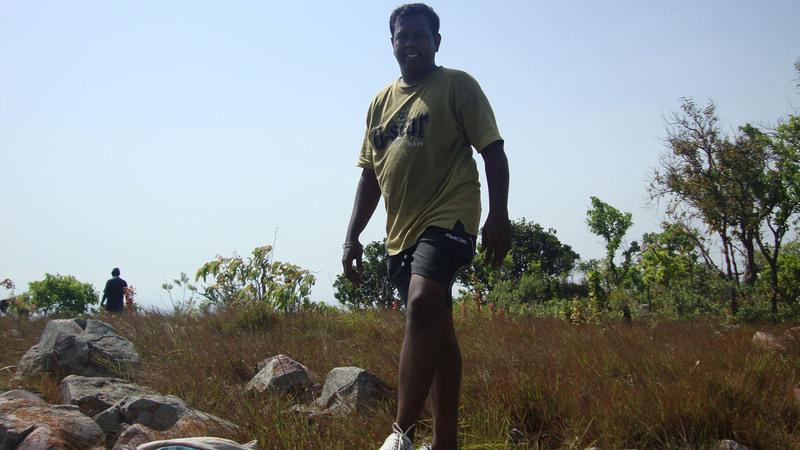 The next idea suggested was to call up some of the trekking club members who are there in Chennai. Kept calling one by one whom ever Ashwin and Anand knew.. It was too late and most of them didnt pick the call. Few who picked the call found difficulty in reaching the location. Finally the crosscalls went to Ansar ahamed. with whom I was there in the earlier ” Junglie Lungie”. I didn’t know that Ansar was a terror to those guys.. when these guys saw his number started arguing who to attend his call. Since I knew the number, I volunteered that I will pick the call. They both looked at me strangely. Before I pick the call, the call got cut. Immediately i called Ansar from my mobile. He spoke and said that some one had gone lost in a trek busy in finding who it is… I replied saying that Its ME who got lost and along with me there are 2 guys Aswin and Anand. He cheered me saying that nothing to worry and he will becoming to rescue me. He asked me what do I need? I replied that water is more essential at this point. He promised that he will come with a 5lt can of water exclusive for us. Felt quite happy. The time when all these things happened was 1.20 AM. All that we did is switched on my torch and hanged it in the tree as a sign to point that we are here. Around 2.15AM I could see a light coming towards us with a shout “Hey guys” recognized from the voice that its Peter.. Since it was dark at night, he too couldn’t find any trial to reach us blindly walked on bushes and thorns having only identification to reach us was the torch. And he reached us! Thank GOD. He has come with 2 – 2liter water bottles.. out of which he himself drunk 1lt water on the way. Rest water has been shared among us. When the first sip of water passed through my throat.. felt divine.. after i drunk half a bottle of water started feeling quite energetic though the last food i had was the breakfast. Realised the power of water. Peter was soo tired and lyied down in the grass. I told him that I informed Ansar and he is on the way. while we were talking I noticed a powerful light coming faster into the village. Its none other than the scorpio’s head lights. Peter asked me to inform Ansar not to come alone and take some local intelligence. Ansar accompanied with Gurumoorthy Gana sambandhan ; Sujay Karthik along with a couple of local guys came through a old jeep trail and reached us faster. Sujay carried 2- 5lts of water and we drenched our throats with enof water… and had chocolates too… With all those.. Guru moorthy Gana sambandhan leading, Sujay karthik carrying my bags… followed by the villagers walked for 15 mins.. surprised to see Ansar waiting in his scorpio.. Dunno how the vehicle came on top of the hill. Thanked Ansar and boarded the scorpio that reached the base station at 5.45hrs. Fellow trekkers were resting themselves where were they found places… Shouted at joy.. It was a memorable trek that had a lots of cinematic instances to it capped by the climax of the trek. 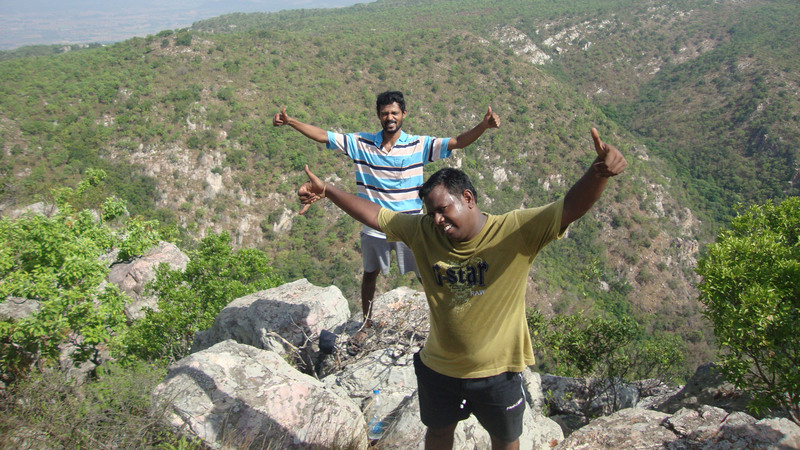 It was not just Nagala Hills conquered, it was also our inner selves conquered. Thus trek went adventurous, discovering and a learning experience. Loved the post nanba. Reminded me one of my misadventures in an island.. Great part of every adventure is rescue, both for rescuers and lost.. Lucky u were later..Loved the post machi.. I Missed master chef sahaya in this…………. Wow! Treks are always fascinating to me but I don’t know whether I can do it. If I have two persons — one on the right and left to hold me, then I can do it.